In case you missed it, I didn’t have an op-ed in this Sunday’s Washington Post. That’s actually normal for me — I’ve never had an op-ed in the Post before — except that last week, a Post opinion editor approached me and asked if I’d consider writing something for the occasion of the Washington Nationals‘ first postseason appearance, making the case why the city’s $667 million stadium deal might still be a bad one for D.C. residents and taxpayers. I wrote that D.C. taxpayers were paying for the stadium, but it’s actually being paid for by taxes on large businesses and taxes on concessions and ticket sales. I wrote that stadium taxes are paying for one-third of the construction cost, but actually they’re paying for twice the cost, and the stadium bonds are set to be retired early. The Post’s figures are that 85% of Nats fans come from the suburbs, so isn’t spending by those fans a net gain? I supplied answers — more on that below — but the reply was the same: Sorry, it’s being spiked. I’m writing about all this here not to slag the Post in particular — they were actually very apologetic about the whole mess — but rather to point out how widespread economic innumeracy is among the general public, as well as in news coverage. Each of the objections raised to my piece is an example of a common misconception about how public subsidies work that helps sports owners (and other purveyors of “public-private partnerships”) sell their plans to stick the public with hundreds of millions in costs and still claim that it’s a win for taxpayers. 1. It’s only business taxes and stadium taxes that are paying for the stadium. This one baffled me the most when I first read it — last I checked, businesses were taxpayers, too — but the logic goes something like this: The D.C. Chamber of Commerce agreed to a tax surcharge to raise money for the stadium, so it’s really private businesses paying the largest share of the bills, not the public. This is a commonly used argument among stadium boosters: It’s not taxing everyone, it’s just taxing business owners/car renters/cigarette smokers/etc. First off, this overlooks the fact that across-the-board business taxes aren’t totally cost-free — at least some small chunk of it is going to get passed along to consumers, or decrease businesses’ spending in other areas and so depress the local economy slightly. But there’s a far bigger problem as well: Once you levy a tax increase for one item, that’s a tax you can no longer use for anything else. My favorite example here remains the four sports lotteries that Maryland put in place to fund the Orioles and Ravens stadiums (it’s not taxpayer spending! it’s just those gamblers paying for this! ), only to have the state discover when it later wanted to add new lotteries for other needs that the lottery market was tapped out. In short: Tax money is fungible. A business tax may or may not be a good way of raising revenue, but however you slice it, once it lands in the public treasury it’s taxpayer money, and if the city then spends it on a stadium, that’s money that’s not available for anything else. 2. The stadium is paying back twice its cost. This is what other outlets reported this summer, but it was a gross misreading of what’s actually going on, which is that those tax streams being funneled off to pay for the stadium are running above prior projections, thanks to the fact that D.C. is the one place in the nation where the economy is actually doing well. That doesn’t mean that the stadium is paying for itself, though — it’s still city tax revenue that’s paying for the stadium, it’s just paying for it more quickly, because D.C. businesses and residents are paying more in taxes. And, of course, while this is the case so far, tax revenues can swing wildly from one year to the next. Cincinnati’s two stadiums were at one point being paid off quickly, too — before the economy took a nosedive and next thing they knew they were having to sell off public hospitals to make up the shortfall. 3. Suburbanites make up 85% of Nats fans, so that’s all new money to the city. I see this argument time and time again, and it’s based on a gross misunderstanding of the substitution effect: It’s not money spent by out-of-towners that should count as new spending, but rather money spent by people who otherwise wouldn’t spend it in D.C. So people from Rockville who otherwise would have gone into the city to eat at District restaurants — or, for that matter, people from Iowa who are in town on vacation and take in a Nats game instead of going to the Kennedy Center — still represent money cannibalized from existing spending. Now, are all these points arguable? Sure, though I’d certainly argue that doing so with all of them simultaneously requires twisting your brain so far over backwards that grey matter leaks out your ears. More to the point, though: None of this is arguing about facts, but rather about the interpretation of facts. Which you would think would be the whole point of opinion pages. Instead, my interpretation was ruled outside the bounds of acceptable debate, because people in power say that the Nats’ stadium is a money-maker, so it damn well must be one. Nats May Win, But They’re Still a Loss for D.C.
There’s no denying it: As moments worth waiting for go, this is a big one. When the Washington Nationals take the field today for the National League Division Series opener, the broadcasters will run down the numbers. It’s been eight years since the former Montreal Expos relocated to D.C. Thirty-three years without baseball before that. Seventy-nine years without a postseason appearance, and 88 since Walter Johnson brought home Washington’s only championship. This, no doubt, was what Mayor Anthony Williams anticipated on that day eight years ago when he donned a red cap, led council members in a round of “Take Me Out To The Ballgame,” and declared proudly that “the American game is rounding third and at last heading back home to the nation’s capital.” After a years-long search for a new home, the Expos would be transplanted to Washington in exchange for a promise of a $440 million stadium — a number that later swelled to $530 million, then $614 million, and ultimately $667 million, almost all of it footed by taxpayers. So how has it worked out? The excitement over a division title aside, any economic benefits are still uncertain. What’s now more clear than ever, meanwhile, is that when Williams bargained to land the Nats, he gave away the store. The ballpark itself generates some tax money, but only enough to pay off about one-third of its cost. And while stadium boosters like to tout ballpark taxes as found money, they’re not: Most people have a more or less set amount they spend on entertainment, and if they’re plunking down cash for baseball tickets, much of that substitutes for dollars they’d otherwise have spent elsewhere. In fact, because ballpark taxes are kicked back to the team to help pay for Nationals Park, any spending shifted from Dupont Circle restaurants to ballgames ends up a net loss for taxpayers. Washington, with so many fans coming from outside city limits, comes out a little better in substitution terms. But even if we count half of Nats fans as “new” spending, they’d each have to spend more than $300 a game on tickets, food, and souvenirs for D.C. to be made whole on its annual $32 million stadium tab. All this would be easier to swallow if it were just the price that cities have to pay for pro baseball — but all evidence is that D.C. badly overpaid for the Nats. Let’s go back to 2004: MLB had obtained the Expos and promptly set out to conduct a bidding war for the team’s services, but after two years it had gone nowhere, and the team was playing several “home” games a year in Puerto Rico in an attempt to draw fans. (Asked if this should be considered an embarrassment to baseball, Selig could only mumble, “I don’t know if ’embarrassment’ is the right word.”) Other suitors for the Expos’ hand included northern Virginia, whose leading candidate, Arlington, had just withdrawn its bid on the grounds that citizens didn’t support it, and Portland, which a few years later would cement its commitment to baseball by converting its only ballpark to soccer-only, driving its minor-league team out of town altogether. One pair of prospective owners turned out to have faked their resumes as investment-banking tycoons; another, to have falsely claimed that he once sang backup for Sting. With rivals like those, Mayor Williams could have felt justified in thinking that he had the leverage to take a hard line in stadium talks, especially with three new anti-subsidy councilmembers set to take office. But when baseball relocation chief Jerry Reinsdorf told Williams that his proposed two-thirds/one-third public-private split “is fine, but three-thirds/no-thirds is more of what we had in mind,” Williams didn’t tell him to get the hell out of his office. He said, in effect, “okay” — agreeing not only to pay for the stadium, but for all cost overruns and future capital repairs as well. Instead, D.C. could have done what Seattle did this year: Emboldened by a voter referendum that barred sports deals where the city didn’t turn a profit, the city council there told hedge fund financier Chris Hansen that if he wanted a new NBA arena, he’d have to pay for it mostly from his own pocket. Because Seattle, like Washington eight years ago, is by far the league’s best vacant market, Hansen agreed — and even agreed to give back some arena taxes to pay for transit improvements. It’s the rare case where city leaders realized that teams need access to their ticket buyers more than the city needs a sports franchise, and won. If Williams and the D.C. council had followed that path, then today Washington could have not just its first pennant in eight decades, but a stadium that is a model of how to host pro sports without draining the public treasury. And that would be a victory worth celebrating. 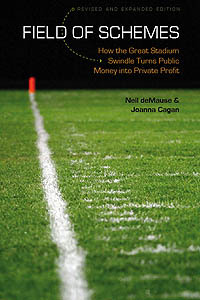 Neil deMause is co-author of Field of Schemes: How the Great Stadium Swindle Turns Public Money Into Private Money and runs the stadium news website fieldofschemes.com. This entry was posted in the sports-media complex, Washington Nationals by Neil deMause. Bookmark the permalink. Very well done, Neil. I still remember that the best pro-stadium argument I heard came from Michael Wilbon. It was essentially, “the city council is going to waste the money anyway, so why not spend it on something cool?” At the time I laughed out of exasperation. The one quibble I have with the Op-Ed is your willful blindness towards the reason that D.C. is booming. It’s the expansion of the federal government. A few new parks and metro stops provide little compared to the siege of lobbyists and contractors that have been recycling Uncle Sam’s largesse into the local D.C. economy. Excellent article and discussion Neil. FYI, the Federal Payroll (according to BLS establishment data, B1 series) was 22,576,000 in Jan. 2009 and was 21,949,000 in the last non-estimated month (July 2012–with minor increases likely the number is still estimated well under Jan 2009 for Sept. 2012). I do not doubt that lobbyists, contractors, and consultants have increased (much to my dismay) but the number federal employees have not. Floormaster Squeeze snuck in. The Times article does note that D.C. got a disproportionate share of stimulus money; it’ll be interesting to see if and how things change now that that’s fizzling out. It’s playoff time, man! This is no occasion for rational argument… come on, it’s “Gooooo local sports team! Yeah!” and damn the torpedoes. For what it’s worth, I’m surprised that the WP lacked the moral fibre to print this excellent piece. I suspect if Katharine Graham were still with us and still in charge of the operation, it would have been printed (though she wasn’t always opposed to burying stories, of course). Now that’s funny. Yeah, a small chunk. It was interesting to see former mayor Anthony Williams in the second row behind home plate for a couple of important games in the final week of the season. I assume it was the team’s way of showing appreciation for those negotiating skills. It’s only a tax on large businesses, and only within D.C., so their power to pass along the costs to consumers will be limited, since their smaller-sized and suburban competitors would be able to undercut them on price. There’s some cost there, but it’s less than if D.C. had used, say, a broad sales tax hike. Which is why I think the “Once the money’s gone, it’s gone” issue is a bigger concern. The argument that much of the stadium is being paid for by suburbanites holds a lot more water in DC than you give it credit for. The reason is that DC is not a state, has no representation in Congress and does not have full home rule. DC is not allowed the full taxing authority that any other state does. DC has to provide a lot of services to residents of Maryland and Virginia that commute into the District daily, but it has limited means of taxing those individuals. Unlike any other state that has the power to tax income at its source, DC is denied this power. Is that money cannibalized from existing spending? Perhaps, but the point is that it is being cannibalized into a revenue stream controlled by DC, not the Feds (most of those gift shops in the Smithsonian Musuems do not pay DC sales tax on their items), and not MD or VA. Like it or not, that matters – and pretending it does not is a serious oversight. If suburbanites complain, they can help join the fight for full voting rights for DC – but the fact that suburbanites pay carries a lot of weight in DC. That’s not to say that the ballpark was or was not a good deal, but simply dismissing that argument will do you no favors in DC local fiscal issues. Right, which is why in the initial op-ed I said that D.C. “comes out better in substitution terms.” But that still doesn’t mean that if 85% of fans come from out of the District, then all of their spending is substitution-free. Some of them would still have been paying D.C. taxes on whatever they did for entertainment if the Nats weren’t around — not all, probably not most, but some. I think an interesting article would be to compare the impact Montreal has seen since the Expos left with whatever DC has gained. Are there any economic studies of the loss of a major sports franchise? There was a study that showed Milwaukee was better off in the years it did not have Braves/Brewers done by some UWM professors (I want to say John Zipp was involved but a quick check shows nothing). I read it about 15 years ago and found it compelling (they made the economic case but also made a looser but compelling case that there were social benefits in the better use of the free time of its citizenry). I think there is no way to control for all the other factors going on when comparing city development over time (Milwaukee had some golden years without MLB but how much of a role did no baseball have–and you could drive 1.5 to Wrigley). That said, I love sports but as long as other cities are willing to offer large public investments it probably makes little economic sense for your city to follow that development path (afterall, sports are not the only form of entertainment). Montreal makes a lot of public investment in its festivals and activities. It is a great city to visit. DC is a great city to visit as well but for different reasons. I’m not sure there are many people in Montreal who realize the Expos have left. I think there are many who care that the Expos left. If you are basing that on the last few years of attendance – well, the building they played in was falling apart and was horrible to watch a game in. With 65,000 seats you were guaranteed to never have to fight for a seat or buy in advance. And with about 10 years of drama over whether the club would stay or leave or if it could even compete if it did… yeah, I get why people were dulled into not caring about the team anymore. That was a city that could’ve used a new ballpark and had Molson Field ever been built through PSLs and stadium sponsorship people would probably have a different view of Montreal as a baseball town today. The post thoughts were correct and you have made some massive assumption that just aren’t true. The biggest fail in your logic is that DC would have created this tax for anything other than a stadium. Its based on the unrealistic idea that the money would be collected regardless (or that people would just spend there money on something else in DC). First the tax wouldn’t have been approved for something basic like education, or housing. This is a fallacy. It wasn’t going to get created and on top of that the idea that congress was going to let businesses get taxed higher is also unlikely. There are plenty of dedicated taxes in the world that lawmakers only approved for particular purposes. (In New York, there’s one that I pay each year to fund the subways and buses.) That doesn’t make them free money. MLB would not have ok’ed an open-air mallpark in Mtl., that as well as the deficiencies for revenue generating at the MLB level doomed the Expos – not to mention the lack of a real real ownership interest that can operate in the post-reserve clause era. Expos fans want things (business of baseball) to be the way it was when the franchise started in ’69, that world is long gone. They lost the tv exclusivity across Canada when the Jays surfaced – that brought in good tv $$$’s, corporations left Mtl. because of the separatist votes – more $$$’s lost – and the only local willing to make a go of it (Bronfman) saw the handwriting on wall. Expos caught lightning in a bottle but that energy could not be sustained once the initial interest died off. The morass that D.C. is now in up to their keesters by breaking the bank for MLB is the fate that the city/province wanted to avoid after going through the ringer over the big owe. I think the more telling issue regarding Nationals Park is that in spite of having the best record in baseball this year, the Nats only finished 14th in average attendance (2.4 million fans overall)–and that’s only slightly better than what they acheived in their inaugural season in which they came in 19th, their high water mark until this season. (The lowly Red Sox, Cubs, Twins, and Rockies all finished higher in attendance than the Nats.) So, for all the talk about what a new stadium does for the community, the honeymoon effect in Washington wore off rather quickly. That doesn’t mean that Washington is a bad baseball town (hey, I’m a native! ), but even with demographics to die for, there are many more entertainment options to choose from, particularly when going to the ballpark has become like a night at the opera or a trip to a five star restaurant. Apart from the excellent points that Neil makes in his piece, the fact that the stadium itself didn’t produce the kind of capacity crowds you’d expect from a return of baseball and a championship-caliber club pretty much demolishes the idea that public subsidies bring a tangible benefit to the cities that provide them. Perhaps if the Lerners had to foot the bill, they might have opted for something more intimate like Wrigley (2.8 million fans) or Fenway (3 million fans) rather than spending $600 million-plus of the public’s money on another HOK look-a-like venue. As for getting disinvited from the opinion page after they solicited the piece, that’s a new low for the Post. Katherine Graham may have presided over a paper that was once highly regarded for its investigative journalism, but now their biggest profit center is the Stanley Kaplan educational group that they own, one of the most egregious abusers of government loans in the for profit education world. Unfortunately, Wash Post Co. is just another big corporation looking for government subsidies. Neil, one thing that I’d like to read more about is the private funding/financing that was available at the time. I seem to recall at the time when the DC Council was looking to get off the hook for funding the stadium, DeutscheBank (among others) came to DC with a plan to finance the stadium. IIRC, the DC Council seemed offended that someone could come in and make money on the stadium. And ultimately, the DCC paid for the stadium and took the risk to make it work. One of your primary points is that DC could have pulled a Seattle and got all tough with the MLB. Well, thats fine for a place like Seattle, but it didn’t work for DC because both Virginia and MD were also lobbying the MLB for the team. MD, or VA is nor more than 6 miles in any direct from the center of the District, pretending like DC had any bargaining power against the MLB in location when VA and MD were rolling out the red carpet is is pretty naive and DC would have lost what has become the single most effective development anchor the city has seen since Target in Columbia Heights. You also went out of your way to sidestep the development thats taken place at the Navy Yard. If you aren’t going to credit the stadium, then you have to identify what did foster it. “Eventually” SE DC would have developed on its own, but considering the District was already 7 years into its largest real estate boom in the history of the city and not one developer had announced plans for SE or put a spade in the ground, until Mayor Williams announced which of the 4 proposed locations would serve as the new stadiums location, I think that DC would have had to wait decades for the development that has already happened down there. The 6 city blocks between I and m and New Jersey and South Capitol was nothing but a couple strip clubs and a bunch of car lots and run down single story buildings. The Ballpark District alone will contain 465,000 to 785,000 square feet of retail/restaurant space, 350,000 to 1,600,000 square feet of office space, 1,900,000 to 3,600,000 square feet (1570 to 2980 units) of residential space, and we havent’t talked about the ancillary development at The Yards etc. Again, despite the metro stop having been opened for 15 years prior to the stadium breaking ground, no development had happened. So while you would like to say the metro stop and housing boom had something to do with it, the actual facts don’t support it at all. As for Williams’ leverage, Frank, MD was never in the running for the Expos. VA was, but Arlington had just taken itself out of the bidding in 2004, and no one else in VA was stepping up. MLB had no other viable options other than D.C., though obviously they could have decided to suffer through another year or two of red ink in Montreal and hope a new suitor emerged. On the development in the Navy Yard: I’d say that the stadium probably sparked interest in the area, sure. But if the stadium hadn’t been built, would nothing have happened in that area? Or would the pressure of the booming D.C. economy and the increased interest in living in the District have led to construction anyway, as it has (for example) in Columbia Heights? The only stadiums that have had successful development around them in other cities are the ones that were in already-redeveloping neighborhoods, so I’m really skeptical that Nationals Park has some magical condo-sprouting power that they don’t. The business of baseball certainly has changed. That is undeniable. Part of that change is the MLB now distributes nearly $40m annually to each member team.